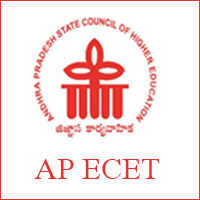 Andhra Pradesh State Government Higher Education (APSCHE) Board released the AP ECET Notification 2019 on 11th February. Jawaharlal Nehru Technological University, Anantapur organizes the Engineering Common Entrance Test 2019. APECET Exam Dates has been announced by the Andhra Pradesh State Council of Higher Education. AP State Government invites online applications from the eligible candidates. 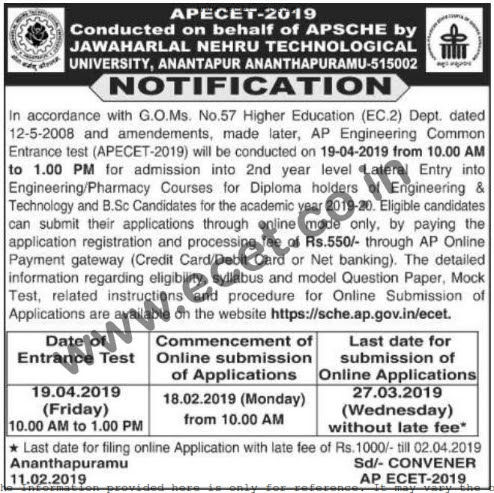 The Andhra Pradesh ECET Online Applications are available from 18th February to 27th March 2019 at the sche.ap.gov.in Applicants have to pay Rs 550/- as APECET Application fee through challan, debit card or net banking. ECET exam is specifically for diploma holders and B.Sc Degree holders in the state of Andhra Pradesh. Every year the government of Andhra Pradesh conducts the Engineering Common Entrance Test ECET for B.Tech admissions. AP ECET exam is to fill the various courses of engineering seats in various colleges of Andhra Pradesh. For the academic year of 2019-2020, JNTU, Anantapur is going to conduct the AP Engineering Common Entrance Test 2019. The Degree Aspirants who are interested in studying B.Tech courses can apply for AP ECET exam. APSCHE released the ECET Notification 2019 for the students to occupy seats in B.Tech colleges. Students who completed a degree or diploma in B.Sc (Maths) can utilize this AP ECET Notification and apply on or before the last date, i.e., 27th March 2019 from sche.ap.gov.in/ecet To enter into the B.Tech colleges as a lateral entry, the AP ECET exam is important for degree candidates. Interested aspirants can check the AP ECET exam pattern, eligibility, important dates and application fee details on this site. Aspirants can go through the following sections to get the details about APECET Late Fee, Eligibility Criteria, Eligible Branches. Candidates can also obtain the AP Engineering CET Online Application Forms 2019 here. The AP ECET exam is mainly for diploma/B.Sc holders to give admissions into B.Tech lateral entry seats and B.Pharmacy courses in the state of Andhra Pradesh. With reference to the Official AP ECET Notification 2019, we are providing the details of eligibility criteria here. The candidates who are appearing for AP ECET 2019 exam can check the education qualification on this page. The candidates should possess Diploma in Engineering/ Technology/ Pharmacy and B.Sc. (Mathematics) from a recognized institution. Aspirants who passed the 3-year degree in B.Sc with Mathematics as one of the subjects in their group are also eligible. Hence candidates can click on the Eligibility Branches of Admission Based on APECET 2019 Exam. Upto 23rd March 2019 without late fee. Upto 2nd April 2019 (Late Fee) Rs 1000/-. Application fee: Rs: 550/- before the last date. The applying candidate can make the payment either through online (credit/debit card) or offline (challan). The application fee will differ with the date of submission of online application. So, candidates can also check the official website of AP ECET regularly. Starting date of Application 18th February 2019. Closing Date of Online Application 27th March 2019. AP ECET Exam Date 30th April 2019. JNTUA released the exam dates of ECET on behalf of Andhra Pradesh State Council of Higher education (APSCHE). Having knowledge about the important dates of AP ECET Exam will help the applying candidates without being late. So, we are providing the important dates of Engineering Common Entrance Test in the below table. Candidates can click on the link below to Download AP ECET 2019 Notification. The APSCHE released the ECET short notification and inviting applications from aspirants only through online mode. You can find the application form link on this page or visit sche.ap.gov.in/ecet official website. You can follow the below procedure to fill the AP ECET Application form. The application form released on 18th February 2019. Follow below steps to apply for AP ECET Notification 2019. Firstly, visit the sche.ap.gov.in official site and register there. Enter the details of qualification, personal information, contact details in the application form. Upload the signature and photograph in the required column. Finally, save and take a print out of the application form. The JNTUA will release the admit card for AP ECET exam few days before the examination, i.e., 11th April 2019. All the details regarding AP ECET Admit Card 2019 issue date and exam date can find on this site or sche.ap.gov.in In the month of April 2019, the JNTUA will release the Admit card of ECET exam. Students who applied for Andhra Pradesh ECET exam can check the official site of APECET to download the APECET Hall Ticket. Candidates can obtain the AP ECET 2019 Syllabus here. Through the APECET Exam Syllabi candidates can able to plan their preparation perfectly. We have provided the complete Andhra Pradesh ECET Exam Syllabus such are included sections, the number of questions from the particular topic. Meanwhile, candidates can click on the below link to get the AP ECET Exam 2019 Syllabus in addition to the Exam Pattern. Along with the syllabus, candidates can also Download AP ECET Previous Papers for effective preparation. Candidates can practice the APECET Last 5 Years old Exam Papers, Solved Question papers, and also Model papers to do good in the Andhra Pradesh ECET Exam 2019. After the evaluation of AP ECET exam completes, the AP government releases the ECET Results. The candidates who appeared for AP ECET can check the result of ECET exam on our site www.ecet.co.in or on the official site sche.ap.gov.in/ecet Therefore, we will provide the direct link of AP ECET Result 2019 whenever the exam results are declared. So, keep visiting our site for fast updates about AP ECET 2019. Sir igot a 44 marks oc candet ihave wite card sir is thare give schlorship sir please tell me about it sir…. sir,ecet exam conducting again for 130 members on june 5th.why?please tell me sir. sir,ecet exam conducting again only for 130 members on june5th.why?please tell me sir. Sir when the counselling conducted for eligible in ecet exam.